On 13th February 2017, a protest in Lahore turned violent when a suicide bomber detonated, killing at least thirteen people and injuring many more. As previously reported on the CIVICUS Monitor, peaceful assemblies can become dangerous and susceptible to attack and interference from terrorist groups in Pakistan. The February protest in Lahore was organised by pharmacists who were protesting against new legislation being enforced by the regional government. Jamaat-ul-Ahrar, a group aligned with the Taliban, claimed responsibility for the suicide bombing. As described on the CIVICUS Monitor, Pakistani authorities continuously harass and intimidate critics of the regime. In January 2017, approximately a dozen civil society organisations (CSOs) in Punjab province received letters from local and provincial authorities ordering them to immediately halt their work, which had been deemed as "anti-state" activities by the local government. The majority of the targeted CSOs promote human rights, in particular women's rights. This incident reflects an overall increase in repression of CSO activities, especially of those working on human rights issues. 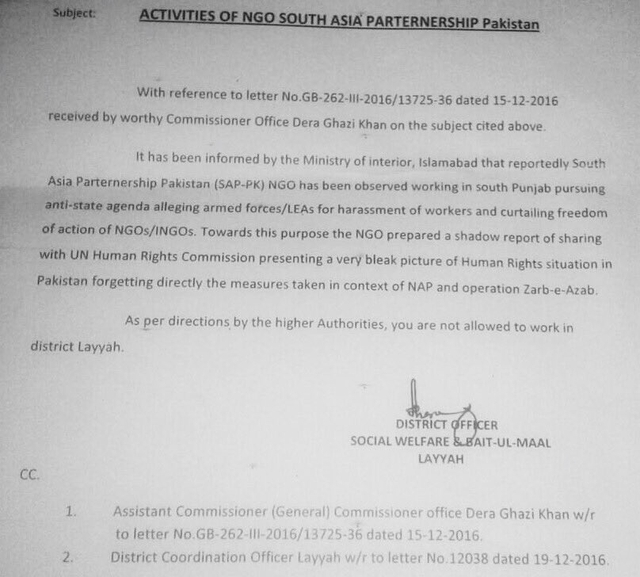 One of the targeted CSOs, South Asia Partnership Pakistan (SAP-PK) had its activities in Layyah banned. SAP-PK works in rural areas of Pakistan with marginalised communities and has previously been the victim of unwarranted harassment from the authorities. The letter forcing the organisation to stop its activities claimed that SAP-PK had been pursuing an anti-state agenda and had obstructed the operation of Zarb-e-Azb, a military offensive against terrorist groups operating in the region. The South Asia Partnership in turn filed a petition in the Lahore High Court challenging the government's order. On 23rd January 2017, the Lahore High Court suspended the authorities' orders for SAP-PK to stop its activities. The chief justice allowed SAP-PK to continue its activities and ordered the government to take no coercive action against the staff of the organisation. Another Lahore-based CSO, Women in Struggle for Empowerment (WISE), also received a similar letter and also challenged the order in Lahore's High Court. WISE was accused of being "detrimental to national/strategic security" and was ordered to immediately cease operations. After filing a court petition, the judge ruled that WISE could resume activities on 25th January 2017. The recent disappearance of four bloggers and social media activists has increased concern over the dangers facing dissidents in Pakistan. Salman Haider, an academic, journalist, rights activist and blogger for the DAWN newspaper's website, went missing on 6th January 2017 in Islamabad. Ahmed Waqas Goraya and Asim Saeed disappeared from Lahore on 4th January 2017. And Ahmed Raza Naseer was detained by plainclothes officers from Nankana Sahib in Punjab on 7th January 2017. All four activists were known for their secular views and open opposition to the authorities' intolerance and religious extremism. While the bloggers returned to their homes safely at the end of January 2017, they have since gone silent, and it is still unknown what happened to them after they disappeared. Their abductions represent the severe consequences one can face for exercising the right to freedom of speech in Pakistan. Another blogger also disappeared on 7th January 2017 and has yet to be found. Samar Abbas, President of the Civil Progressive Alliance Pakistan and a well-known champion of minority rights was abducted from Islamabad by unknown assailants. His whereabouts and welfare are still unknown. On 12th January 2017, the Pakistan Media Council of Kalat's Press Secretary, Jan Muhammad Shahbaz Samalani, was shot by unknown assailants on motorbikes. While the motive behind his murder remains unclear, his murder in broad daylight shows how dire the situation is for journalists who are attacked and killed with impunity. Civic groups working on freedom of expression in Pakistan have strongly condemned the killing.